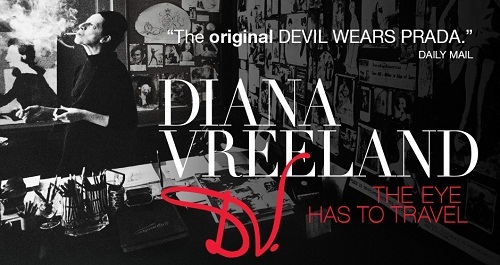 I was hoping before posting Candace's review of Diana Vreeland: The Eye Has To Travel, that I would have a chance to see the film/doc and add in my own two cents. But it's two weeks later and I still didn't get to see it. Not a problem, as Candi's Corner once again did such an in depth review, my two cents aren't necessary. I couldn’t quite remember how I came to hear about Diana Vreeland until two days after seeing her granddaughter in law’s film based on Vreeland’s life story. It was through Andre Leon Talley, who for the Millennial Generation knows him from his appearances on MTV’s The City and America’s Next Top Model. 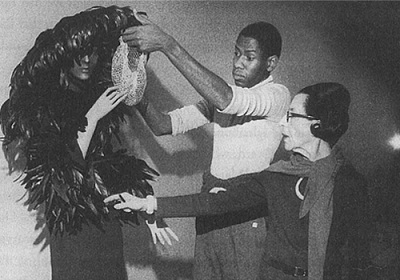 Talley had Ms. Vreeland for a mentor in the 1970’s, as he continued to strengthen his eye and knowledge for fashion within the Metropolitan Museum of Art Costume Institute in New York City. When I first read about this early part of Talley’s fashion career, I figured that Diana Vreeland was an ambitious woman. 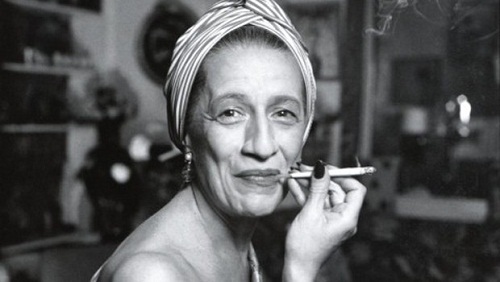 I just didn’t realize how marvelous and inspiring she also was until watching DianaVreeland: The Eye Has to Travel. 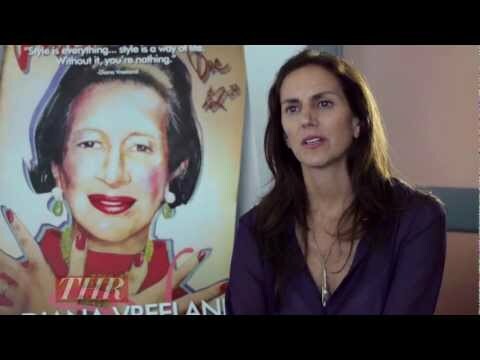 Lisa Immordino-Vreeland’s documentary weaves the type of story that seems so decadent, yet universal. 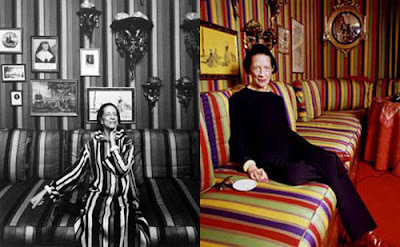 In the first twenty minutes of the film, at least one viewer will immediately feel pangs of jealousy, as it highlights the luck bestowed on Diana Vreeland having been born in Paris, during the romantic Belle Époque age. Even as a child, she could see that her life was surrounded by beauty and wealth. She was born in 1903, a few years after the invention of the telephone and the world had only begun to see what the movies could do to the human imagination. Diana was blossoming right with the phenomenon of ‘the city/’The City’; she was literally growing into herself, just as the world was doing the same, especially in Europe and New York City, where she moved to as a young child. Diana was encouraged not to rely on her looks. Her mother often compared her supposed unsatisfactory outward appearance to her sister’s attractive features. So, she learned to observe and express herself through dance. If she wanted to be seen, it would be for the movement of her limbs and her style above all. Two of the most fascinating facts exposed in this documentary - finding out that Vreeland was not Ivy League educated. And that her first paying job, which was as a columnist for her famous “Why Don’t You…” column in Harper’s Bazaar in America, came to her at the age of 34 (!). Vreeland lived life to the fullest extent in the Roaring 20’s, witnessing another rising, Josephine Baker, in the clubs, before becoming a celebrity. This status was one she earned through hard work and a genuine passion for art and beauty, not consciously thrust upon her by a studio head or music mogul. She was discovered by Carmel Snow, the editor of the American version of Harper’s Bazaar from 1887-1961, because of her great fashion sense. However, Vreeland took this divine intervention in her life and turned it into a raison d’être for people who didn’t even know the type of beauty that could exist between the pages of a fashion magazine. If you anticipate on seeing this documentary and aren’t the most fashion-obsessed person, you will be in awe of the still pictures and history behind the first moments when Vreeland’s progressive vision introduced the world to a different type of beauty. 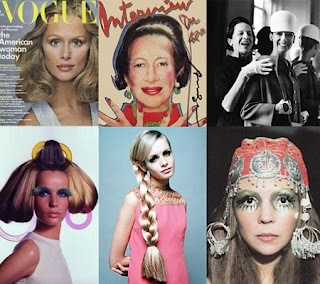 Unknown models then, such as Veruschka, Twiggy, Penelope Tree, Lauren “Betty” Bacall, Mick Jagger, Cher, and Barbra Streisand became the cultural icons that they are now, thanks to Diana Vreeland - atypical beauty became celebrated. This tale doesn't show Vreeland as an all omnipotent being, as the film interviews her two sons, Fredrick and Tim, who remember how unconventional and sometimes emotionally and physically distant their mom was. The film continues to show how even someone like Diana could be seen as weak, as attention is drawn to her husband’s infidelities, of which she knows, yet dares not mention nor spend too much consideration on those incidences. With thoughts of a dour world economy hovering over many of our heads, Diana Vreeland’s decadent life story immortalized on the silver screen could seem offensive. But it can also be a testament to those who continue to “think outside the box”, utilize common sense, wits, and intellect, and are brave enough to inform an understanding of their world in order to imagine new ones for others to enjoy and dream. Diana Vreeland: The Eye Has to Travel is a stimulating story about a woman who rejoiced in her work and imperfect beauty. Through her prosperous life and vibrant persona, this documentary reminds us living today that the eyes must travel not just all over the pages of fashion magazines, but beyond the surface of what or who is in front of us to ultimately find truth in ourselves.